Codes: P, P/T, J&P, J/C, EMH/7, etc. Star Trek meets Strictly Ballroom. What they own, they own; what I own, I own. Greetings to you, your wife, your parents and your children! You asked me to explain the events of last night. I couldn't then, but I did promise to write the whole story down and send it to you before we got out of range. It may take me a while; luckily yours is a patient species. It all began with Tsunkatse. You may be surprised to hear that the Dance is a violent martial art form to a civilization a thousand lightyears away. Voyager's crew doesn't talk about that incident much nowadays, but at the time we were obsessed - we couldn't get enough of it. I was a mild case compared to Chakotay and B'Elanna. B'Elanna and I weren't married back then, by the way. We came across Tsunkatse more than a year ago, while visiting the Norcadian homeworld. The games were broadcast throughout the sector - they were fast-paced, exciting and reminiscent of several sports on my own homeworld, so far away. It seemed like a wonderful form of recreation. But the truth was not so savory. We discovered that the players were prisoners on the heavily-armed broadcast ship when two of our own people were kidnapped for the game. We got Seven and Tuvok back eventually, but she had been through quite an ordeal. She almost killed her Tsunkatse mentor during a death match. After we got our crewmembers back, no one wanted to talk Tsunkatse anymore. We hid our souvenir betting chips or threw them away. The Book of Tsunkatse became a very rare item indeed. B'Elanna missed the game - I could tell. Still, it wasn't for her that I started the whole thing up again. I don't know what our EMH sees in Seven. I know what the rest of the red-blooded males of Voyager see in her, but whatever his sentience I just can't picture the Doc feeling that way. I think his emotions come from opera and literature; he's a hopeless romantic, like Chakotay. More about Chakotay later - the first culprit was the Doc. He was concerned about Seven's mental state after the incident; I can understand that. The rest of us thought that she was back to Borgness as usual, but he was closer to her than most people. Maybe he was right - he is the nearest thing we have to a psychiatrist on board, though his psyche isn't much healthier than anyone else's. Anyway, he got the idea while reading up on local medical practices in the peaceful hegemony through which we were passing - I've forgotten their name already, but they called their version of Tsunkatse 'Tunkai'. It was a non-contact sport. We have those sorts of martial arts back on Earth, my homeworld, as well - forms purely for display, exercise, meditation or self-discipline. The medical practitioners of the area prescribed Tunkai for all sorts of physical and mental maladies. I thought the miracle cure was no more than a nostrum and that the local doctors were quacks, but he chastised me for my prejudices. He didn't scold me too hard, though, because he needed me. Guile is not his area and getting Seven to take up Tunkai would require some skill. Needless to say, I managed it. Chakotay and B'Elanna were quite willing to take up the sport. A bit of medical rhetoric from the EMH, who believed every word of it I should add, convinced Tuvok to participate. Chell and Megan Delaney were also among that first group. I didn't practice Tunkai myself, but I did learn all the forms in order to make the holodeck training program. It was nice to see B'Elanna sweaty and skimpily clad without the looming threat of a bat'leth, too. Seven was eventually drawn in - she couldn't resist the opportunity to lecture us on the proper forms from the Book of Tsunkatse, claiming we could never understand Tunkai without reference to its more violent source. As we crossed the hegemony, we came across several variations of Tunkai. I expanded the holoprogram, and the dancers - it's premature to call them that, but that's how you know them - expanded their repertoire. Jenny Delaney joined us, bringing a few of her girlfriends. After the hegemony we came to the Eudamon Homeworld. They had a particular innovation to Tunkai that augured much, though we didn't see the signs at the time. And so, as we had in the hegemony, we learned all we could about it. I expanded the holoprogram, but this time it was much harder. Instead of a few holograms programmed to demonstrate the Tunkai forms, I had to make fully animated sparring partners. Tunkai was still nonviolent - you weren't allowed to touch your sparring partner - but now the forms had to be coordinated with the mirror forms assigned to the partner. The EMH agreed to join us, and to help me model more holographic sparring partners from his matrix. It was a lot of work for me, but Tunkai was becoming an obsession. Crew members would come to our practice sessions just to watch, or would solicit private instruction from Seven or Chakotay - always our best dancers, until...but that's for later. You, K'yanat, are an important official, and I'm sure you wonder how we rank amateurs in the dance found so much time to practice and to make the impressive showing we did the other night. You have a world to run; you learned the dance in childhood, like language and culture. We few lost souls from the Alpha Quadrant have been drifting through deep space for seven years now. We have our duty shifts, but afterward we have plenty of time on our hands. As for me, I had B'Elanna, but most of the others were lonely and looking for something to fill the empty hours. The biggest mystery to me was why Tuvok remained in the dance. He must have thought it a waste of time once the Doctor gave Seven a clean bill of health - perhaps he did it for 'the needs of the many', that is, for some obscure Vulcan reason. I didn't ask, because I was desperate for male dancers once we left the Eudamon and found that sparring partners were of opposite sexes in the next three inhabited star systems. Of course, it was no problem by then to make more male holograms, but the advanced dancers preferred to practice with live partners. That was when I convinced Dalby, Farley and Ayala to join in the dance. But I was fighting a losing battle, for Dorado and Celes had been practicing secretly under Megan and Jenny's tutelage. They joined us in the main group too, and seemed to have a natural talent. In my desperation, I began to participate myself - but it wasn't only the male/female ratio problem that got me into the dance. I'd come to practice one morning, just to observe as usual, and seen Chakotay and B'Elanna 'sparring', as we called it. My stomach turned a few somersaults, because Tunkai had changed; it was already more like the Dance as you know it than like Tsunkatse. B'Elanna used to have a crush on Chakotay back in the Maquis...well, never mind about the Maquis - that's a longer story than this one, and this one has hardly begun though I've been at it for a week now. I foresaw in that moment the future of Tunkai, and the last thing I wanted was for my girlfriend to go on 'sparring' with Chakotay. Sure he was in love with someone else, and she was in love with me, but space is a lonely place and the Dance...well, you know about the Dance. So I put to practice all the theory I had used to make the Tunkai holoprogram, and quickly became one of the more proficient dancers. B'Elanna was my partner from then on. It was wrong of me to doubt her - I was the one at risk. I would regret ever learning the Dance soon enough, but that's later in the story. The next system marked a turning point for Tunkai, Astin, Ashtinse, Atun, Shantes, Xante, and all the other names we'd heard for the martial art over the course of five months. In the Pemij system, as well as in their colonies, the Figures were added to the Forms. My dancers were shocked at first, but soon they were gliding about the floor of the holodeck in what to us seemed a weird mix of martial arts and ballroom dancing. Harry had held out until this point, saying he needed the time to practice the clarinet, but I brought him to the holodeck one day to see Seven dancing with the EMH, Celes with Dalby, and Megan Delaney with Farley, who was not yet up to her speed as a dancer but was quite the ladies' man. I don't know which one he was more jealous of, but he, too, decided to learn the dance. The holodeck was getting crowded as more of the crew became interested in Tunkai. Chakotay, the EMH, Seven, B'Elanna and I went down to the Talbenong homeworld to observe the Dance - the Tsunkatse incident was far enough behind us that we weren't shy anymore about watching live performances of our favorite sport. I suppose we had begun to think of ourselves as professionals, and books and holovids were no longer sufficient for our training. Our Doctor is a chatty guy, and he ended up revealing to one of our hosts that we knew Zanash, as the Dance was called there. They invited us to join in, but Seven refused flatly on our behalf. B'Elanna demanded to know what the problem was, right there in front of our host. For his part, he stood aside and pretended not to eavesdrop as Seven revealed her objection. "You have not been observing the participants closely," she informed us in her Borg way. "This is not our version of Tunkai - they are touching one another." I gasped. Perhaps one of our novice dancers back aboard Voyager would have thought this development only logical, but we old-timers still thought of Tunkai in terms of the original form we'd taken up - a still and solitary martial art. This mental block would continue to plague us - or me, at least, as you shall see. The injunction against contact with your partner was deeply ingrained in us. There had been some reports from Pemij of 'flirts and children' touching their partners, but nothing we'd taken seriously. "It's a dance," Chakotay concluded aloud. "We must be tracing it backwards - the dance is the original form and Tsunkatse is the altered one." He was our anthropologist, so we believed him. I think he's writing a book about the Dance, or at least I hope he still is after what happened on your world. So he, Seven and I began to search, many months ago, for the origin world of the Dance. Back on Voyager, we advertised the changes in Tunkai. We called it a dance, and invited whatever wallflowers still hadn't learned it to participate. Soon the holodecks were overflowing, and my holoprogram was running most of the day and long into the night. Neelix and Ayala would stack up the messhall tables and chairs every night to make room for one of the intermediate classes. Large classes were held in the shuttlebay, the only place with enough floor space for the more complex figures we'd picked up from the Talbenong. There was hardly a crewman who didn't know the basic steps of the dance, with one glaring exception that I'll get to in a moment. Strangely enough, the first public performance of the Dance wasn't until my wedding, five months ago. The Captain had seen various practices and beginner lessons - made especially dull by Commander Tuvok, who had given up his advanced partner when the Dance got too racy for Vulcan sensibilities (i.e., at Talbenong) and had taken over the instruction of new dancers - so I think she was surprised to see the Dance in its full form. 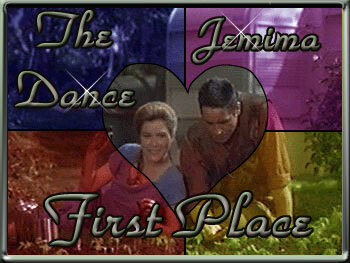 I danced with B'Elanna, of course, and Chakotay danced with Seven. I was caught up in my own affairs, as you can readily imagine, and did not note the other couples. I assume they fell into their usual pairings. By the time B'Elanna and I got back from our honeymoon, trouble was afoot. Did the Dance remind the Captain of her Victorian holonovels, or was she merely jealous of her protege, Seven of Nine? I never knew. Chakotay had been trying to convince her to try Tunkai since the beginning, and now that she was showing some interest it was really too late. She couldn't submit to the ignomy of the beginning classes - she was a starship captain, after all. It wouldn't be dignified to be tripping over Neelix the cook and his favorite partner, six-year-old Naomi Wildman. Nor did the Captain have the kind of holodeck time it would take to learn the Dance from my holographic instructors. For reasons most of us understood, she would not take private lessons from Chakotay, though of course he offered. In fact, all the failed negotiations over possible instructors went through him: the Doctor was too much of a schoolmarm, Tuvok was an old friend in front of whom she wouldn't want to embarrass herself, B'Elanna didn't know the man's part - none of the women did anymore, nor did we know theirs. Chell, Dalby, Ayala and the rest weren't close enough to her - again, the problem of a Captain's pride and position. Harry was a promising lad but he wasn't good enough to train others yet. If you've been following my convoluted tale, you may realize that left us only one advanced dancer. What Chakotay said to B'Elanna to get her to go along with it, I'll never know, but she came to me soon after with a sour look on her face and informed me that I would be teaching the Captain the Dance. I didn't ask 'why me?' because I knew. The Captain and I have similar backgrounds, and I'm a sort of reclamation project of hers. I wish I had time to explain, but if I don't write faster we'll be out of communications range. Suffice it to say that I was the obvious choice, and now that I was married, I was 'safe'. Nor was it just Chakotay pushing the plan - the EMH was in on it too. His ultimate goal was to break up Chakotay and Seven so he could dance with the Borg himself. "Teaching her to dance is not going to get her to dance with Chakotay," I told B'Elanna. "I don't know why he bothers." "He's doing it for her, because she wants to learn Tunkai. He doesn't expect to get anything out of it," she claimed. I didn't buy that disinterested bit for a minute. If she learned to dance, he must have thought that someday, somehow, somewhere, she would dance with him. He's a man who lives on hope like the rest of us live on food. "We wouldn't want aliens saying our Captain can't dance, now would we?" I joked, for she was still looking grim. She glared at me. "I'm making a big sacrifice for Chakotay. He owes me now." That was one of the many times in my life I have opened my big fat mouth and put my big fat foot in it. "I don't see how you're making a sacrifice, and he's being so noble, when I'm the one stuck teaching the Bane of the Borg to dance." "Let's get this straight, flyboy," she snapped at me. "I don't trust you as far as I can throw you. The only reason I'm letting you do this is that I trust her. If she won't lay a hand on him," - meaning Chakotay, of course - "then she's not going to mess around with you. Now go teach her to dance." Such was my newlywed wife's faith in me, and you will hear for yourself whether it was ill-placed. I was our last great hope, so Chakotay could not be trusted to make the negotiation. I would lure and catch the Captain myself - I was, after all, a professional. As one of the senior dancers, I made certain matters my responsibility. One of them was the use of the shuttlebay. I brought her there one day to discuss security issues and rearrangement of the shuttles for the benefit of the dancers. The latter was just to rile her - "This is a starship, Mister, not a dance hall," she retorted, though later, when the shuttles got in her way, she was more than willing to shift them a bit. Ayala was there teaching an intermediate class, so we stood to the side and watched them for as long as she would allow herself. When I saw she was about to make her excuses and go, I signaled Ayala. There was still an atmosphere of the martial arts among the senior dancers - he obeyed my implied orders without question, dismissing the class immediately and marching them out the door almost by force. Then I turned on the flyboy charm, as my wife likes to call it. "Would you care to try, Captain?" "Did Chakotay put you up to this?" she asked. Of course I couldn't fool her, but if I could provide her with a good enough cover story, she just might play along. "I take my orders from B'Elanna now," I answered. She gave me a searching look, and seemed satisfied with what she found. The Captain dropped into a little curtsey, as the Truvong do before the dance, then grasped my hands in the First Form. The curtsey was out of style already; I figured I'd give it about a month and then tell her. And so we began to dance. She knew a lot already - she must have been watching us more than we thought, or reading up on the Dance - and she was a natural. Even then I knew she'd be better than B'Elanna someday, and possibly better than Seven herself. That I thought such a thing about my new wife was a bad sign, but I am by nature a calculator of odds and angles and Tunkai. From then on we practiced in the shuttlebay, an hour or two a day, and all classes had to be scheduled around our sessions. It may seem odd to you, K'yanat, that B'Elanna would lend out her husband, and that the larger classes would dissolve at a word, all for the sake of our Captain, who was only comfortable with me and in that cold and sterile environment. Yet that was the way it was: the crew would do anything for the Captain, run any risk, walk into a Borg cube and get themselves assimilated - anything. What was a little dancing by comparison? Or so I thought at the time. Yes, it would have been much simpler if she could have danced with Chakotay, but our fleet on the other side of the galaxy has regulations against that sort of thing. Not against martial arts, no, but against fraternization. They were afraid of where dancing might lead. After all, your version of the Dance is something even a Brazilian might find racy. Never mind about what a Brazilian is. So things went on like that for a couple of months. We had our little tiffs and mutinies, but in the Dance all was forgotten. And the Dance itself changed as we moved from system to system, picking up new styles. It was left to Seven, again, to voice what was going on. I was dancing with B'Elanna on the holodeck one day, along with several other advanced couples including Chell and Jenny Delaney. Seven drew Chakotay aside unexpectedly and insisted on observing the Dance - so she informed us afterwards, when we gathered around them to see what the matter was. "There seems to be a problem," she explained. "While B'Elanna and Jenny were dancing, their pupils became dilated and their skin temperature rose at least .3 degrees centigrade beyond that which would be expected for the exertion involved. I wonder that the Doctor has not noted this effect." Jenny turned bright red and rushed from the holodeck, and of course her sister ran after her. B'Elanna just glared for a moment - she made a lot of trouble the last time Seven pried into humanoid mating practices, but this time, she controlled herself admirably. "I'll go check on Jenny," was all she said. Tunkai does give one self-discipline, after all. When B'Elanna was gone, and the threat of sudden death with her, the Doctor attempted to explain the issue to Seven. "It's a natural reaction which I did note, though I would suggest you not point it out to any more flushed dancers." "I have not had it," Seven replied defensively. I'm afraid I can't tell you how Chakotay took that comment, because no one dared look at him - least of all the intrepid EMH, who did try to help, nonetheless. "You still think of Tunkai as a martial art, Seven. The others see it as a dance form, a rather romantic dance form." "I prefer my approach," she answered the Doctor. "You always do," I contributed. That earned me a glare from the Doctor but a chuckle from Chakotay, and our session broke up. I was still chuckling when I reached the shuttlebay and pulled 'our' metronome out of its hiding place on the Delta Flyer. I looked up at the observation deck, but it was dark as usual. I knew the Captain and I were watched from that room by various people for various reasons - my wife to see that I kept out of trouble, Chakotay ostensibly to check on our progress, and others for pointers and tricks. She was that good, even back then. The Captain would have ripped out my lungs and mailed them to the Vidiians had she known we were being watched. The observers had a hearty fear of the Captain, but any dancer would risk his life for the chance to watch her out on the floor - you've seen her, K'yanat; you know. And I wasn't half-bad myself; between her and B'Elanna, I got more practice than anyone else on board. She walked into the room. Well, K'yanat, maybe you knew when she walked in the Great Hall three weeks ago - has it been so long already? - that she was trouble. But I, idiot flyboy that I am, had forgotten. Suddenly I was petrified, though I couldn't have said why. Before she could say a word, I started the metronome and took refuge in the Dance. And we danced. We dipped, we swayed, we went on for half an hour without speaking. As I'd predicted, she was already better than B'Elanna, and though as a dutiful husband I'd tried to ignore that fact, that day on the shuttlebay floor my calculating eye got the better of me and I began to watch her, really watch her, as we danced. Have I mentioned that I'm a medic? I noticed that her skin was too warm, and her eyes too dilated for the brightness of the sterile shuttlebay, and that she was beautiful. That was when I lost it. My feet knew enough to go on across the floor, but my mental equilibrium was gone. Was I in love with the Captain? I fought with every fiber of my mind to get away from that question, but I was still slipping towards an answer. There was only one way to block out that thought. We came to a dip, and I took a fall. I made sure she wouldn't be injured, and managed to break my elbow with a gratifying crunch while padding her fall. There was never a sweeter pain than shot up my arm and into my unhappy brain at that moment. I was very good at what I did - be it dance or deceit. We limped off to Sickbay. Having the right to refuse treatment, I wouldn't let the Doctor give me anything for the pain. I did let him hypospray me with an antibiotic to make it look good, or she would have gotten suspicious. I whispered to him to treat her bruises first and get rid of her - he saw the rare glare in my eye, and did as I told him for once. He made up some excuse about needing to have a look at my tendons before knitting the bone, and not wanting her to have to wait around. "I would have my medic treat you," the EMH joked, "but he's incapacitated at the moment." He's a good guy in a pinch, our Doctor. She was apologetic; she thought it was her fault. I told her to get going, that it was embarrassing for a medic to be a patient, and what else I'm not sure, because the pain was almost blinding me but I couldn't let it show. "What is going on, Tom? You're not a rank amateur that you should be falling down in a dip." He was more suspicious of that than of my refusing the pain medication. "I did it on purpose, and if you treat me too soon, I may have to do it again." "Are you saying you tried to crack the Captain's skull open on purpose?" "No, I broke my arm on purpose. I like it broken - put the bone knitter away, Doc." "You can't dance in your condition," he joked, his fingers creeping towards his holographic commbadge. "Do not tell my wife." He lowered his hand. "What happened?" he asked, more gently. I glared at him for his trouble. "I am not dancing with the Captain ever again." "Who is going to teach her to dance, Tom?" His schemes for Seven were still uppermost in his mind. "She can already dance, Doc, believe me." He knew enough to change the subject. "May I treat your injury now?" he asked. I was lying on a biobed already - with a little help from my good arm, I lifted my injured elbow and slammed it back down on the bed. Those beds are pretty soft; I didn't even pass out, not for more than a few seconds, anyway. I enjoyed the red haze for a moment, then told him, "Now you can." He didn't ask any questions until the bone was fully knit - perhaps he was worried about a repeat performance. "What did she do?" he finally asked. I sat up. "She didn't do anything," I said evenly, while flexing my elbow in hopes of a twinge or two of pain. "She's a lonely woman, and I'm a married man, and I'm never dancing with her again. You dance with her." "Yes, you. Best of luck, Doc; you're going to need it." I don't know if it was a chuckle or a growl or just a drawn breath that I heard, but I turned around and there by the door was Chakotay. He must have come in while I was unconscious. "Commander," I said, in a voice of ice. "Lieutenant," he nodded, his tone no warmer, but it seemed his business was with the EMH. "Doctor, you are her new partner." Chakotay was the best dancer, so his word was law. He turned and left sickbay without another sound. I gave him a few decks' head start, then left sickbay myself. Directly outside I ran into Seven of Nine. "I don't want to hear it, Seven, whatever it is," I said, and walked past her. She followed me. It's not pleasant to be followed by a Borg that way, no matter how long she's been disconnected from the Collective. "I am afraid for your safety, Lieutenant." "Join the club," I answered without stopping. "The Commander and I watched you dance." That stopped me dead in my tracks. I wondered that I was still alive. He must have known I'd done it on purpose - he knew the Dance better than any of us. "I remarked to the Commander that the Captain's body temperature was above normal and that her pupils were dilated." I hit the nearest bulkhead with my elbow, though not hard enough to break it again - I'd seen enough of the Doctor for one day. What can I say in Seven's defense? She was Borg, with half the processing capacity of the ship's computer in her cranial implants, but underneath it all she was still a blonde. "You are not to make those comments to anyone, Seven - do you understand me?" "I will be more circumspect in the future, Lieutenant. As you seem to have guessed, his reaction was not positive. I am informing you of it because I am afraid the situation may lead to violence, and Tunkai is a non-violent sport." "It's under control," I muttered, and walked away. Was it only three months ago? It seems like a lifetime already. It's been a month since we left your world, K'yanat, but now you understand why I am writing this account so slowly. I must do it in secret, late at night when my wife is asleep, or in the morning while she's in the sonic shower. Fortunately for you, she takes the longest sonic showers of anyone I know. From that day forward, I waged my own little war against the Dance. I milked my injury for all it was worth and didn't dance for a week. I seized the holodeck to run my old movie theater program, but even I couldn't go cold turkey. I showed old Terran dance movies - Singing in the Rain...well, never mind which ones. I tried to revive the old martial art versions of Tunkai. I strove for cultural diversity, and before anyone knew what had happened, the dancers had fragmented into sects - foxtrotters, waltzers, English country dancers, Bolian round dancers - any dance from our distant homes was fair game. Seven and Chakotay stayed together, and led the stately Bajoran folk dance. B'Elanna had an unparalleled talent for the Lambada which I, of course, encouraged. Vulcans don't dance, but Tuvok taught a few old Romulan dances of which the Captain and her unofficial partner, the EMH, were especially fond. But for all my effort, I couldn't really kill the Dance. Late at night, after a long session of Swing or Cha-cha in the messhall, the last dance was always Tunkai. Rumors abounded of the Captain and the Doctor being spotted at odd hours headed to or from the shuttlebay. The Delaney sisters held secret classes in a cargo bay. Chakotay kept up with his research, and the information trickled down through the other advanced dancers to the intermediate ones. I even saw Neelix making some little flair of the wrist Chakotay had picked up at a space station only three days behind us. They gave me a wide berth, but the Dance went on without me. One day, only a few weeks before we reached your world, my wife dragged me out of bed to see something. The instant she said 'deck nine' in the turbolift, I knew where we were going - the observation lounge of the shuttlebay. Besides being a chatterbox, the Doctor was an exhibitionist, and he couldn't let his trysts with the best dancer on board go unwatched. Seven and Chakotay were there - I suspect that they were always there when she danced. No one appreciated Tunkai like those two, and then there was their personal interest in the figures below us. But why had B'Elanna brought me? "I had no idea she was that good," my wife whispered in my ear. "You did well, flyboy, very well." The lounge was completely dark, and I couldn't tell if she meant more by those words than you see on the surface of them now, K'yanat. I kissed her on the cheek, and turned my attention to the shuttlebay floor. The Captain was good - even better than I remembered. My heart skipped a beat, but it was only for the beauty of the Dance. Still, I had to wonder whether the Doctor cared anymore about his scheme to exchange partners with Chakotay. "Let's dance," I said to B'Elanna, and left with her for the main entrance to the shuttlebay. Seven turned to follow us, but Chakotay must have held her back. I heard him say, "We can't dance with them, Seven," and I heard her ask why, but the doors closed behind us and cut off his answer. We crept into the shuttlebay and had joined the Dance before the Captain knew we were there. She smiled when she saw us, and danced on. I'm sure the unhappy couple watched us from above, for however it may have hurt them not to dance with us, they loved the Dance as much as anyone, and we were good at it - we were very, very good. That was the last time anyone saw her dance - except perhaps the EMH, who wasn't talking - until we reached your world, K'yanat. You were significantly off our course, but as I said, we'd been looking for the origin of the Dance for some time. And what's a few weeks out of a seventy-year journey? We'd been known to infiltrate pre-warp cultures merely to watch them dance, but fortunately yours was a warp-capable society. The Captain ordered Chakotay and Seven down to your planet, and, as an afterthought, me as well. And here, K'yanat, after five weeks, I've finally come to the part of the story you know, or at least, you think you know. Your venerable father greeted us, and we negotiated a trade agreement. The truth is, K'yanat, we didn't need any of those minerals, nor were we particularly short on food. All we cared about was the Dance, but no one expects aliens to come to their world for dance lessons. We needed the cover story. Now you will think we plotted the entire affair - that's not true. It was just our luck that we came on the day of the annual Great Dance. I don't expect you to believe it, but we would never have survived the past seven years in the Delta Quadrant without exactly that sort of impossible luck. My theory is that one of the Q is looking out for Captain Janeway - never mind who the Q are, though. Well, we knew we'd struck gold when your father mentioned the Great Dance, but we were cool, very cool. Chakotay asked in his best deadpan - and he's the definition of deadpan - whether we could observe the Dance, and your venerable father agreed to allow us ten guests at the affair. I knew right away who they should be, and Chakotay didn't disappoint me in his recommendations to the Captain. Why did he choose couples? Did he hope to dance, and to see the Captain dance? Perhaps subconsciously he did. You recall the dancers: Chakotay, Seven, the Captain, the EMH, Chell, Jenny, Megan, Harry and my wife and I. Harry was a late bloomer, but I think he did us justice. And so we came to the Great Hall in our dress uniforms, to watch the Dance. Your venerable father and mother demonstrated it alone on the dance floor - was that for our benefit? Did they believe a hundred couples on the floor would confuse us and obscure the Forms? We suspected as much, but nevertheless it was informative. The Dance was almost exactly the same as the latest version we'd learned - in systems close to yours, not much change has been introduced. And you, K'yanat, were talking to our EMH about photonic life and how he got along with us organics. I heard your entire conversation, though I wasn't eavesdropping intentionally. I just hear things. "We all know the Dance." And then, on behalf of your parents, you invited us to dance. I've never seen a glare like the glare the Captain glared at the EMH that day - she had never danced in public, to her knowledge, except for those dull Romulan dances. While she was glaring, I was listening to an odd exchange behind me. "We can't dance with them, Chakotay," Seven said, not loudly enough for the Captain to hear. He mumbled something even I couldn't hear, and she answered, "You have not been observing closely." Seven stalked past me, grabbed the EMH and half-dragged him onto the dance floor. There they stood, hand-to-hand in the First Form, waiting for their cue. Your parents must have been surprised, but they didn't miss a beat. I was confused. What had she seen with her bionic eye to make her change partners? What whispered secret had she heard with her Borg ear and translated with her built-in translation matrices? Before I could sort that out, K'yanat, I saw the question in your eyes and knew more trouble was afoot. As Jenny and Chell made their way onto the dance floor and assumed the First Form beside Seven and the Doctor, I made my way over to you. You'd already backed up from our basilisk Captain, and I maneuvered you farther away from my companions. "You're very kind," is that what I said? I provided just enough filler for you to ask me the question that was on your mind. In the meantime, Harry and Megan took up the First Form beside the others. "Can a hologram marry a flesh-and-blood woman in your society?" you asked. I apologize for deceiving you. I didn't lie; I merely avoided the question. B'Elanna came up behind me in time to hear my non-answer: "A machine made man and a woman made machine - is that so strange a couple?" Her approach had distracted me, so neither of us saw what you did, K'yanat. "And those two," you asked, "how long have they been together?" We turned to see whom you meant, and saw the Captain and Chakotay, already in First Form, waiting for their cue with the others. B'Elanna tried to answer your question honestly, but I cut her off, saying "Seven years." Then I brought my wife over to join the others. Did I warn them? Did I tell them that it was not our version of Tunkai? No, not then. I assumed the First Form with my wife, gazed into her eyes, and fell in love with her all over again. "Now don't get mushy on me, flyboy," she whispered. "We're here to show these people how to dance." I apologize for her presumption, K'yanat - modesty is not a Klingon trait. Then our cue came, and we danced. We dipped, we swayed, we flowed across the Great Hall like running water and rushing wind. We were in rare form, K'yanat - we were worshipping in the one true temple of the Dance, and it brought out the best in us all. I saw the others only at intervals, as more and more of your people joined in the Dance and obstructed my view. But I ask you in all seriousness, K'yanat, was there anyone on that dance floor to compare to our Captain and Commander? I have seen the Dance danced across a thousand lightyears of space, and I have never seen anyone dance like they did. How long the Dance went on I cannot tell, but when it was finished, and we were all back in our original places, frozen in the Final Form, there was silence for another half hour. I understand now that this is your version of applause, but at the time I was worried that we had given offense. Perhaps Tuvok had come down to check on us and revealed our secret. I could see our Captain and Commander from where I stood. They were staring into each other's eyes. Of course, that is part of the Final Form, but it seemed to me that they were still dancing across the Hall in their minds - dipping and swaying and turning, until the gong sounded and the Forms broke up. I gathered the others together quickly and whispered, "You should not have danced this dance. This is not our version of Tunkai." The Captain split a glare between me and the EMH, while Seven simply nodded. I went on to explain, "The other couples are married. B'Elanna and I will stay and make our apologies; the rest of you should return to Voyager before they ask us any questions." Chakotay agreed with me, and the Captain called for a beam-out. I don't recall what excuses B'Elanna and I made to you, K'yanat, once we found ourselves alone among a crowd of admirers in the Great Hall, but we made them quickly and signaled for transport ourselves. We had barely materialized on the transporter pad when the ship went to warp. I wonder sometimes what you thought of us - did you suspect we were all holograms, or maybe a host of the Q come to dance one dance with mortals? When Voyager was gone in the morning, did you doubt your very eyes? And now that I've take six weeks to write to you, do you doubt even my whispered promise of a fuller explanation? There is the end of the story you requested; I could send it to you as is, but I will add a short epilogue to compensate you for the long delay. You understand that the others cannot dance anymore. We have always followed the rules of Tunkai as we found them; at Harry's wedding last week, only B'Elanna and I, and Harry and Megan danced. Seven knows more than she lets on, but she has given up the Dance nonetheless, and as for Chakotay - well, of all people he is the least likely to violate the rules of the Dance. Now I will ask you a question that you can no longer answer for me, because we are far out of range of your transmitters, and almost out of range of your receiving equipment: Was the Dance only for married people, or was it also a marriage ceremony? I don't want to know the answer, because, as I mentioned before, we have regulations and protocols against that sort of thing. I wonder what Seven said, and to whom, on the transporter pad that night, and I wonder, when the Captain left your system so quickly, was it to keep your people from finding out what had happened, or to keep our people from finding out? You see, tonight I resolved to finish this letter, so I snuck out of our quarters and headed for an inspirational location - the observation lounge of the shuttlebay. It was locked. It's never locked. Here I sit on the corridor floor of deck nine writing these last words to you, K'yanat, and leaning against that locked door. I know the Captain and the Commander are down there. If I close my eyes, I can see them dancing across the shuttlebay floor to the beat of our old metronome, dipping and whirling and turning - the most passionate pair of dancers ever to grace the Dance. After all, there are no regulations against dancing.